Here’s a great chicken recipe that is very versatile and very flavorful. It can be served any number of ways, even on a salad. The basic recipe consists of marinated boneless skinless chicken breast marinated in teriyaki sauce with peppers and onions. It makes a great meal when served over rice with some green onions added to the mix. There are also low sodium teriyaki sauce options available on the market which are just as good and contain a considerably less sodium than the original. Here’s the basics. Give it a try and experiment with additional ingredients to your liking. If chicken breast is large, pound to approximately 1/2″ thick with a meat mallet. This will help tenderize the chicken as well. Then cut chicken into strips of about 1″ thick and 2″ long. You should have enough from 1lb of chicken for 2 8″ skewers. Soak the chicken in 1/4 cup of the teriyaki sauce in a ziploc bag for at least an hour in the refrigerator. Cut peppers and onions into chunks of approximately 1″ and soak in the remaining teriyaki sauce in another bag for at least an hour. When ready to make, preheat your Foreman Grill, with the lid closed for at least 5 minutes. Use high setting if you have it. 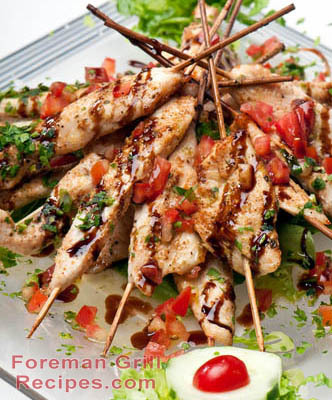 Load up the skewers with chunks of chicken, pepper and onion in alternating order. Place on grill and close lid. It’s usually a good idea to give them a 1/4 turn after about 2 minutes, then cook for another 2-3 minutes.